The Potash Mine near Moab Utah is a mine where the evaporate KCl and other salts are mined. The Paradox Formation contains evaporates such as halite (NaCl), potash (KCl 0 and other salts. The Paradox is intensely deformed due to the salt tectonism in the area. So, underground mining is impossible. Instead they drill holes down into the ground and pump water into these holes. They then pump the water to the surface and put it in the evaporation ponds you see in the picture. The water with the dissolved salt in it evaporates and voila! Potash. 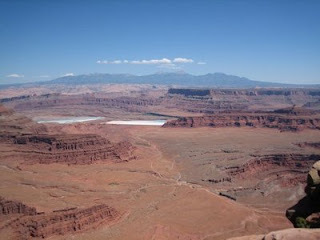 The evaporation ponds are a really obvious feature from Dead Horst Point.